Over the past two decades, survival rates in pediatric oncology have continued to increase; more than 80% of children diagnosed with cancer are now alive at 5 years from the time of diagnosis. New treatment paradigms are emerging, accelerated by an increased understanding of the molecular processes underlying the growth and development of specific childhood cancers. Our responsibility as pediatric radiologists is to complement these efforts and help to bring the best new therapies quickly into clinical practice. 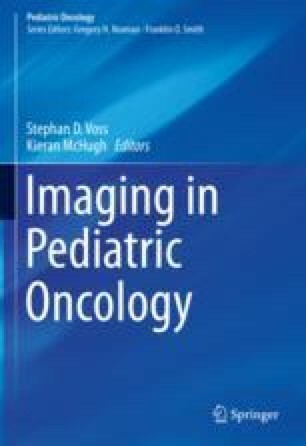 This text has focused on the fundamentals of imaging that every child with a new or treated malignancy receives, and provides a comprehensive update on new advances in diagnostic imaging as they relate to pediatric oncology. Vaarwerk B, Bisogno G, McHugh K, Brisse HJ, Morosi C, Corradini N, Jenney M, Orbach D, Chisholm JC, Ferrari A, Zanetti I, De Salvo GL, van Rijn RR, Merks JHM, on behalf of the EpSSG Radiology Group. Indeterminate pulmonary nodules at diagnosis in rhabdomyosarcoma: are they clinically significant? A report from the European Paediatric Soft tissue sarcoma Study Group. 2019. J Clin Oncol https://doi.org/10.1200/JCO.18.01535, in press.